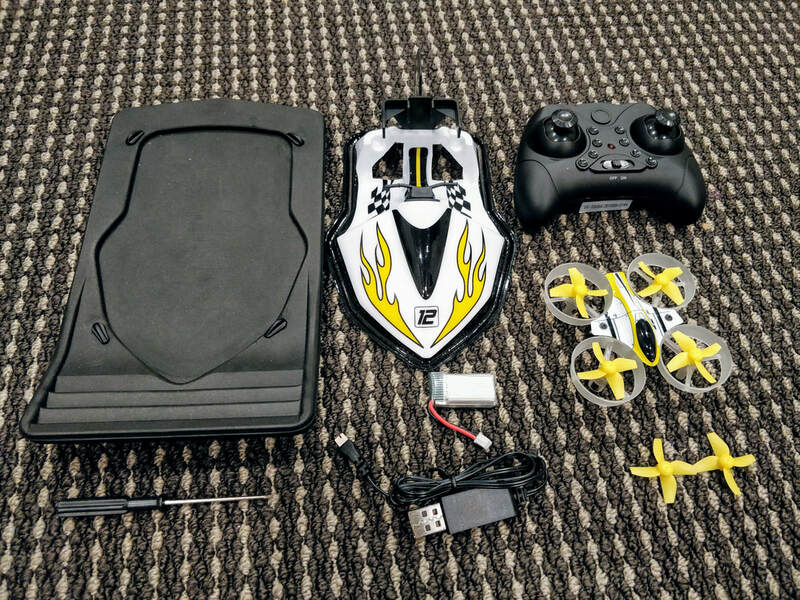 Eachine E015 Review - Drone, car Or BOAT? The Eachine E015 is, at it's heart a simple propeller-protected (ducted) quadcopter. For those new to this type of vehicle it can fly up, down rotate (yaw) left and right, roll left and right and pitch forward and backward. Combining these controls together allows for careful and controlled flight. Like many toy quads it is self leveling meanint will return to a neutral roll, pitch, yaw if the controls are released. Unlike most toy quads though it is has a basic altitude control, making it similar in control to a DJI phantom. This works surprisingly well and for new users means that it can be flown easily without worrying about throttle control - one of the hardest concepts for new users to understand. My 6 year old son has found this immensely helpful as he really struggled with this on his Eachine E011. For those that already know how to fly quadcopters the car mode (hovercraft really is the biggestdraw card. Making a hovercraft out of this style of quadcopter is not new but the execution here is really clever and robust. Firstly the quad simply clips into the polycarbonate quadcopter body and since it is mounted perpinducular to the ground, the built in accelerometer recognises this and switches it to hovercraft mode meaning the left stick provides forward thrust and hover combined whereas the right stick provides left and right turning. Like any hovercraft it holds inertia due to lack of friction so you have to turn early and expect drift so need some space. It is very predictable though so you do get the hang of it vs. say, a car. I really like the simple polycarb shell design, it's light and creates a better air cushion than the foamies I've tried but the way the quad is mounted means the centre of gravity is tall and can tip when you hit obstacles although it's not as bad as it looks. The other thing the polycarb body does is give a lower friction surface when the air cushion fails meaning you can run on lots of different surfaces. I've run on lino, thick carpet and even asphalt and concrete at the kids school. Lastly it is surprisingly durable in this modes. It is faster than you'd expect which makes for some impressive crashes however the light but rigid body shell takes a beating well. In summary the hovercraft mode is a lot more fun than I ws expecting, my son barely got a chance to play because I was hogging it! This is my least favourite mode. A floating base fits onto the hovercraft base which drags in the water using the same controls as the hovercraft. It floats and moves in the direction you want but not much more. I can only recommend for very still water - pools ideally. A word of warning 1: - if it tips over the electronics will be ruined and 2: There is no reverse. Starting from worst to best, boat mode works but just and is inherently risky to being lost or water damaged. Flight (drone/quad) mode is tame but great for learning for a new pilot. Car mode (hovercraft really) is awesome - very fast with great controls that have been well thought out and offers something truly different to flying a quad. For me personally I will use it in hovercraft mode only because of the fun drift driving style but will occasionally share with my son to teach him with quadcopter flight. I'd definitely recommend 3 battery option for more running, less charging.